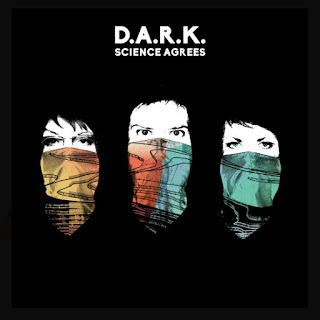 On September 9, 2016, Cooking Vinyl will release SCIENCE AGREES, the debut album by D.A.R.K. Already accumulating accolades for the previously released singles - the new wave "dancer" "Curvy" and the moodier but no less rhythmic "Loosen the Noose", SCIENCE AGREES trades off of the unlikely collaboration between Dolores O’Riordan, Andy Rourke and Olé Koretsky. Dolores, known famously as the singer of The Cranberries, has sold over 40 million albums and also worked with the likes of Angelo Badalamenti and Jah Wobble. Andy Rourke is best known as the inimitable bass player in one of the most important British bands ever, The Smiths - he has also worked with Pretenders, Ian Brown, Sinead O’Connor and Badly Drawn Boy. The third and final member is Olé Koretsky, a Brooklyn-based songwriter, producer and DJ based who has hosted DJ events and parties throughout NYC. The band’s roots lie in a New York DJ-mixing collaboration formed between Andy and Olé, after they met gigging in Washington DC. After a couple of years’ experimentation and laying down tracks in their home studios, a chance meeting between Andy and Dolores resulted in the singer asking him what he was working on. They began sharing tracks and ideas via email and dropbox, building on Andy and Olé’s original demos and, in a couple of instances, Dolores completely re-imagining some of the songs. A project Olé was also working on called SCIENCE AGREES was also incorporated into the mix. The three of them found lots in common musically as well as personally, which allowed them to develop these ideas into an album. Further writing ensued, followed by the three band members meeting up in Ontario, Canada to record live instrumentation and final vocal takes. All three of them arranged and produced the album: a concoction created in NYC and Ontario, mixed in California and mastered in London. The resulting album captures the essence of three distinctive personalities, incorporating their love of electronica and new wave. An array of influences can be heard throughout the album, in particular artists including Angelo Badalamenti (‘The Moon’), The Cure, Depeche Mode, David Bowie – Andy and Olé connected over their love of ‘Low’ – Magazine (‘High Fashion’), New Order (‘Curvy’), Pet Shop Boys and REM, with production and sonic experimentation inspired by Brian Eno, post-punk, post-disco, RZA and modern hip hop. SCIENCE AGREES is a lyrically subtle album that touches on themes of isolation and disconnection,trauma and rebirth (‘Curvy’), drug addiction and love (‘High Fashion’, ‘Underwater’), control (‘Loosen The Noose’), death (‘Steal You Away’), loss of faith and dissatisfaction (‘Gunfight’), and the light that can be found in the creative darkness (‘Watch Out’). SCIENCE AGREES will be available on CD, digital download and vinyl.